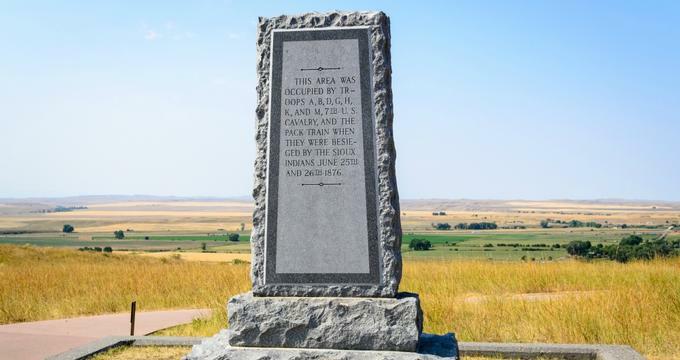 Located near Crow Agency, Montana, Little Bighorn Battlefield National Monument commemorates the 1876 battle site of the Battle of the Little Bighorn, fought between the Lakota Sioux, Northern Cheyenne, and Arapaho indigenous tribes and the United States Cavalry 7th Regiment. The Battle of the Little Bighorn, fought on June 25-26, 1876, has come to serve as a representation of the conflict between the hunter/gatherer cultures of indigenous North American tribes and the Western industrial and agricultural society of the United States, as part of a larger conflict of indigenous displacement rather than an isolated local battle. The previous decade, Lakota Sioux leaders had agreed to the terms of the Fort Laramie Treaty, which had resulted in the formation of a large reservation for the tribe in present-day South Dakota. The terms of the treaty, which stifled the tribe’s nomadic culture, had resulted in conflict with other local tribes and pioneer settlers and been rejected by prominent tribal leaders, including Crazy Horse and Sitting Bull. Tensions further escalated following Lieutenant Colonel George Armstrong Custer’s 1874 survey of the Black Hills area of the Great Sioux Reservation and the Sioux tribe’s subsequent rejection of a purchase offer of the area’s resources by the United States government. In the winter of 1875, the United States Commissioner of Indian Affairs ordered an ultimatum, mandating that all Sioux tribe members report to a reservation by the following year. Following a lack of response to the deadline by tribal members, a strategy to force tribal reservation return was devised by General Philip Sheridan, the commander of Missouri’s Military Division. In the spring of 1876, three cavalry forces totaling approximately 2,500 members were commissioned to respond to an assumed force of 1,500 indigenous warriors near the Crow Indian Reservation and Little Bighorn River in the Territory of Montana. The ensuing battle between tribal and cavalry forces, which lasted for two days, resulted in a resounding victory for the Sioux and Cheyenne people, although their victory proved short-lived as it fueled rationale for further attacks against hostile indigenous forces in the following years. Following the battle, the Little Bighorn site was preserved as a National Cemetery by the United States Secretary of War, which was later incorporated to include graves and burials of fallen soldiers from other conflicts. The Reno-Benteen Battlefield area was added to the site following the later 1887 Battle of Crow Agency, and in 1946, the site was reincorporated as Custer Battlefield National Monument, overseen by the National Park Service. Though the monument was added to the National Register of Historic Places in 1966, archaeological activity was permitted on the site throughout the 1980s. In 1991, the site was redesignated as Little Bighorn Battlefield National Monument. Today, the Little Bighorn Battlefield National Monument site encompasses 765 acres of land within Big Horn County, Montana, near the Crow Indian Reservation and the city of Billings. The Little Bighorn Battlefield National Monument Visitor Center, located within the Custer Battlefield area at the park’s western end, serves as an entrance point for visitors to the monument, offering a 25-minute orientation film, bookstore, and several museum exhibits detailing the military and social history of the area. The monument is divided into three primary areas, commemorating the Custer Battlefield, Reno-Benteen Battlefield, and 1876 Indian Encampment. A 4.5-mile visitor road connects the two battlefields, showcasing approximately two dozen important battle sites via a narrated cell phone audio tour. The Custer National Cemetery, located near the Visitor Center, contains the gravesites of more than 5,000 soldiers, including the fallen 7th Regiment Cavalrymen who died in the Battle of the Little Bighorn. A self-guided cell phone tour of the cemetery’s monuments and memorials is available. Visitors may also explore the monument’s ¼-mile Deep Ravine Trail, which traces battle grounds in the basin below Last Stand Hill. Two 1881 monuments, the 7th Cavalry Monument and the Indian Monument, stand nearby. In addition to self-guided cell phone tours, guided Apsaalooke tours for park visitors are offered seasonally by Crow Tribal Tourism. An Expedition Little Bighorn program is offered as an immersive educational tour experience for students in grades 4-8, focusing on balanced studies of indigenous and United States military perspectives. Teacher’s guide materials are also available for in-classroom preparation and study, adaptable for various curriculum requirements and grade level abilities. A Junior Ranger program also allows young visitors to receive participation badges and certificates in exchange for completion of educational park activities.